With films like Black Panther smashing box office records, African print has taken the fashion world by storm. 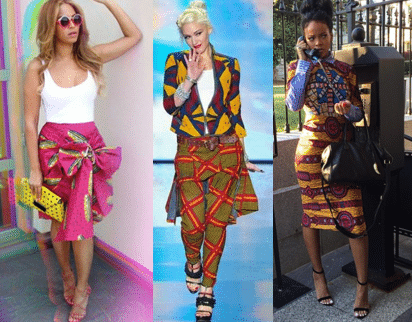 Ankara is now globally accepted and even celebrated as a symbol of pride and elite fashion. Queen Bey has got African print style on lock, from pant suits, mini dresses, skirts, tops, shorts, caps and head wraps. Riri rocked this gorgeous look while visiting the White House. Gwen Stefani rocked these amazing Ankara outfits to the Sephora Fashion’s Night Out Celebrations. Kim was wore this beautiful Ankara dress at the opening of the Wet Republic Pool in Las Vegas. Mother Monster effortlessly rocked this gorgeous Ankara print jacket. Fergie looked fergalicious as ever in this one piece chic Ankara romper. African American style has always had a massive influence on the global fashion industry. Let’s take a look at a few of these incredibly inspirational styles through the decades. Jenke Ahmed Tailly, from Cote d’Ivoire, is using his African heritage to inspire his eye-catching clothing and the attention of A-list celebrities.